The Scientific Committee of the ICSU World Data System (WDS-SC) believes that all Early Career Researchers (ECRs) require a basic set of data-related skills. The following presents essential areas of Research Data Management (RDM) that are relevant to budding scientists and that cover the range of issues they are likely to encounter as they collect, analyze, and manage data over the course of their careers. It has been formulated with the assumption that ECRs play an important role for future data sharing, and must take an interest in data stewardship and best practices in data management, including how to make data openly accessible and reusable. Open Data. Almost all science funding agencies require that research results, including data, be made publicly available. Journals, too, are requesting that authors of scientific articles post their data, and even the code used to generate results. Data sharing and open data are important to the advancement of science, and data reuse has resulted in important scientific discoveries. ECRs need to be familiar with the FAIR principles—that data need to be Findable, Accessible, Interoperable, and Reusable—and work towards data sharing and research transparency in their own work. Big Data. The term ‘Big Data’ arose to describe the Volume, Variety, and Velocity (the three Vs) of data being generated almost continuously by a range of sciences, from Biomedical to Earth Sciences. An ECR should have an understanding of what is meant by Big Data, and how they are increasingly important to a variety of scientific fields. Familiarity with tools and approaches to analyzing Big Data is also an important requisite for career advancement. Definitions and Jargon. An ECR must know some of the terminology in the data arena, such as ‘ontologies’, ‘informatics’, ‘metadata’, and ‘knowledge networks’. 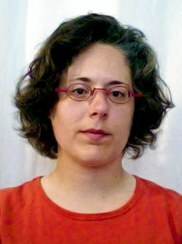 A critical element for data sharing is common definitions, and particular attention should be paid to understanding ontologies, thesauri, and controlled vocabularies: what ontologies are, where to find them, and how to create them, as well as ways for integrating ontologies and using them to support metadata and data disambiguation efforts. Funder Requirements and Writing Data Management Plans (DMPs). Funders increasingly require that scientists articulate through a DMP how they will ensure the open availability of their data for the long term at the onset of a project. An ECR should know how to thoughtfully prepare a DMP that will also increase the odds of them obtaining funding. Awareness of the domain-specific data repositories where their data may be archived is also important (see below). A conceptually ideal DMP is extensible, interoperable, and machine readable, and an ECR must understand why these aspects are needed and how to address them. Data Organization and Storage. Organization and long-term preservation of data is an increasingly daunting task. An ECR should know methods of sustainability to ensure the continuance of databases as they begin to generate data. Documenting versioning, choice of technology and standards, and archiving also need to be understood. The principle that data have several end uses throughout their lifecycle—each with its own requirements—is fundamental within this, and the concepts of ‘Analysis-ready’ and ‘Publication-ready’ (data with quality assurance, citation, and metadata) data should be familiar to an ECR. Metadata Formats, Usage and Data Discovery. Metadata are critical for data discovery and reuse, and are the bread-and-butter of catalogue services. Metadata standards are strongly format and discipline dependent, but common elements are increasingly captured in efforts by DataCite, DCAT, and others. The International Organization for Standardization (ISO) has also developed a number of domain specific standards, such as ISO-19115 for geospatial information. An ECR should recognize the importance of proper metadata development, and be aware of a number of the standards that are available. Data Documentation. To be of use to other researchers, data need to be carefully documented: to describe how they were developed, their limitations, and to what use they may be put. Incomplete and cursory documentation often renders data unfit for future use. An ECR should have knowledge of the different approaches taken to data documentation in various fields of science, as well as of the increasingly important practice of properly referencing protocols, methods, and samples. Data Formats and Interoperability. Data formats and applicable standards for data and metadata are largely dependent on the scientific discipline and the type of software used. There are data formats that are common across disciplines, but this is not the norm. An ECR should support open formats and well-entrenched standardized services (e.g., CSV files, DDI, OGC services, and OPENDaP, to name a few), and having an overview of their scope is a useful starting point for an ECR to make appropriate choices. For a discussion of data standards and interoperability in the health domain, visit AHIMA. Choosing a Long-term Repository. 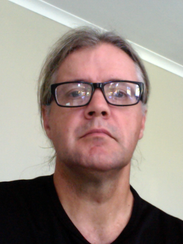 An ECR must have an understanding of not only which disciplinary repositories are best suited to the domain in which they are working, but also the ‘trustworthiness’ of these data repositories, and how this is underpinned by a hierarchy of certification standards (e.g., the CoreTrustSeal). By examining the strengths and weaknesses of different repositories in terms of data access, documentation, and so on, it helps an ECR to conceptualize what makes for a successful data service. Standardization, Licences, and Intellectual Property Rights. To aid in their reuse, data should ideally be made available in standardized schema and using standardized services. Each ‘data family’ has its own set of such standards, and an ECR should know which are relevant to their discipline. Moreover, with Open Data an increasing norm in the scientific community (see above), an ECR should be aware of the different types of licensing and copyright arrangements under which data are often disseminated, in addition to the importance of machine-readable licensing arrangements. Data Ethics. 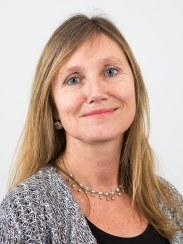 While primarily salient for ECRs working in the Health Sciences, Social Sciences, and Humanities, ethical issues that arise throughout the data management lifecycle should be a topic of broad interest to all researchers likely to engage with disclosive data (e.g., research on rare biodiversity, where there may be commercial interests in their exploitation). Areas that an ECR should have knowledge about include, but are not limited to: data ownership and stewardship, handling sensitive data, consent, privacy and confidentiality, reconciling ethical and legal norms impacting data sharing and exportation, constructing equitable partnerships and data sharing agreements, and navigating the complexity of ethics review. Data Publication, Citation, and Persistent Identifiers. An increasing number of data journals, such as the Nature Group’s Scientific Data, are now available for the publication of datasets. In addition, proper citation of data using persistent identifiers is becoming the norm in the scientific community. An ECR should be aware of the approaches to data publication and citation and the importance of doing these properly. Research Translation and Societal Benefits. To facilitate use of data collected and stored within archives, an increasingly wide range of software has been developed for decision analytics and support. In addition, there is a great deal of work on integrating data across disciplines to support new discoveries. An ECR should understand the value that well-curated and sustained data management provides to the scientific community and larger society, and have some understanding of data indicators, decision-analysis techniques; and the graphical interfaces that can simplify exchanges. Linked ontologies and robust metadata can facilitate these possibilities. Citizen Science and Crowdsourced Scientific Data. Citizen science and crowdsourced data have already proven to be of tremendous scientific value. However, the modest budgets of these initiatives typically mean that systems are lacking for the curation and long-term stewardship of their data. An ECR should know what citizen science is, and how to design an initiative that engages citizens in improving scientific data collection and use: addressing issues of data stewardship, validation, confidentiality, dissemination, and licensing from the beginning. SciStarter provides a good introduction to Citizen Science, and an example of pointers for the design of citizen science can be found at the Cornell Lab of Ornithology. The World Data Centre for Geomagnetism, Kyoto (WDS Regular Member) has been collecting worldwide geomagnetic observation data under the ICSU World Data Centre (WDC) system/World Data System since 1957, collaborating with other WDCs for Geomagnetism in the United States (World Data Service for Geophysics), Russia (WDC - Solar-Terrestrial Physics, Moscow), the United Kingdom (WDC - Geomagnetism, Edinburgh), Denmark (WDC - Geomagnetism, Copenhagen), and India (WDC - Geomagnetism, Mumbai). Figure 1 shows the number of observatories from which we keep data in analogue and digital forms. Optical recording on photo paper was originally used for most analogue recording.The digital recording of the data observed by modern electronic magnetometers started to increase from around 1980, and in 1992, finally overtook analogue recording. In 2000, the number of analogue stations had decreased to less than 10% of the total, and now all data are provided in digital form. In mid-1990s, the Internet and World Wide Web became popular, with WDC - Geomagnetism, Kyoto starting its web service in 1995. 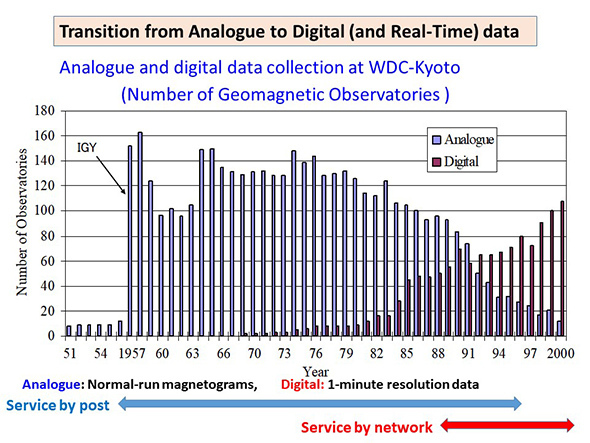 The WDCs for Geomagnetism have been exchanging among themselves the data collected at each data centre for 60 years. During the analogue data era, it took money and manpower to collect data from distant observatories and copy them onto microfilms; and the big data centres such as WDC-A in Boulder (now World Data Service for Geophysics) or WDC-B in Moscow (now WDC - Solar-Terrestrial Physics, Moscow) mainly collected the data and distributed them to the other smaller data centres. 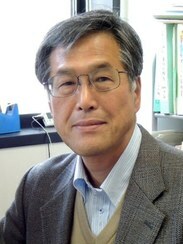 After shifting to the digital data and Internet era, the situation changed. Collecting data via the Internet is much easier than collecting photo papers from distant stations, and international collaboration is also much easier than before. Nowadays, more than half of geomagnetic data are provided through an international consortium, INTERMAGNET (WDS Network Member). The transition from analogue to digital recording thus also changed the main player in the provision of geomagnetic data services. 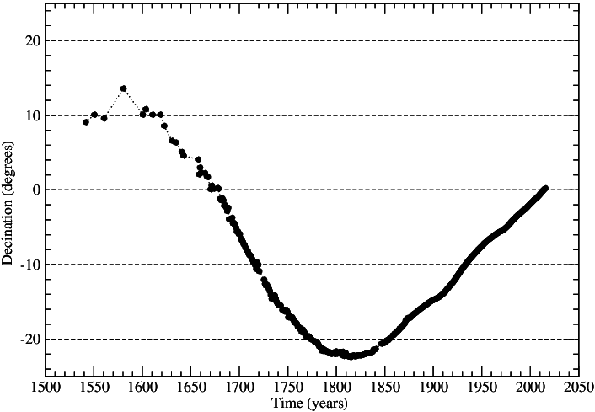 The longest time series of geomagnetic data are certainly the ones acquired by magnetic observatories (Fig. 1), some of which reach a century of uninterrupted measurements. Figure 1. Paris declination series: annual means of declination corrected and adjusted to actual French National Magnetic Observatory - CLF (Mandea and LeMouël, 2016). The whole community of geomagnetic observatories is particularly well organized and federated under the auspices of the International Association of Geomagnetism and Aeronomy (IAGA) one of the associations of the International Union of Geodesy and Geophysics [WDS Partner Member]. Since the beginning of the 1960’s (the birth of the World Data Centre system established in 1957 provided archives for the observational data resulting from the 'International Geophysical Year'), magnetic observatories data have been mostly publicly available (Fig. 2). Getting access to a network of stations is much more interesting than having access to just one isolated observatory. Figure 2. 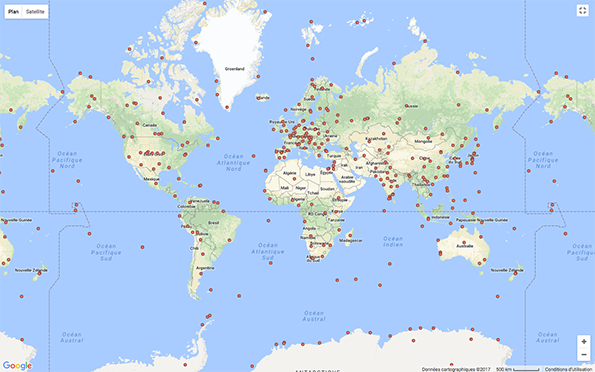 Location of magnetic observatories (all periods) having at least one datum ingested into the Geomagnetism Data Portal of WDC – Geomagnetism, Edinburgh [WDS Regular Member]. The cooperative spirit within the geomagnetic community thus knows a fairly long-standing history that has had to cope with the successive technological revolutions regarding data recording (e.g., analogic to numeric; Fig. 3), but also regarding the way data are made available (from yearly books, via isolated recording supports, up to connected data repositories). In this regard, the community had practices based on fair-play and goodwill recognition of data sources/providers. Such practices worked, and would have worked for many more decades without new challenges to meet the changing requirements of users and stakeholders. Indeed, in our increasingly connected world, it is evermore important to closely follow evolution regarding data management. Some aspects were previously not sufficiently taken into account, such as the discovery, citation, and reuse of the geomagnetic data. Nowadays, it appears no longer possible to keep sources of data for only 'informed people', and the existing licensing conditions for distribution of geomagnetic data and data products are (in part) not adequately elaborated to address this change and need to be improved. Figure 3. Analogue magnetogram from Vladivostok; 24 September 1934 (through ICSU grant-2003 by WDC – Solar–Terrestrial Physics, Moscow [WDS Regular Member]). – Provide recognition and acknowledgement. – Enable creation of new data products from primary data (e.g., geomagnetic indices) or in combination with other data sources (e.g., global models of geomagnetic field). – Prevent the change and/or appropriation of data by a third party. – Enable reuse of data in a reproducible way. – Supply metadata that enable unique identification of a dataset, as well as providing relevant information to the user. – Use machine-readable and widely used licenses. – Enable easy online access to research data for discovery. The work is in progress such that it meets the state-of-art when it comes to applying licenses and minting DOI for geomagnetic data and data products, with the goal to ensure the availability into the 21st century of the tremendous efforts achieved by generations of observers in geomagnetism throughout the world. 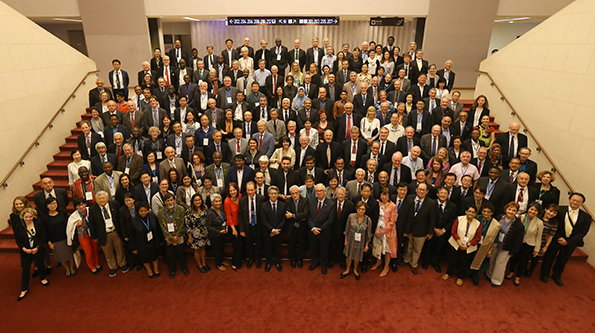 At the end of October last year, the members of the International Council for Science and the International Social Science Council voted overwhelming for a merger of the two organizations. The new organization—which will be called the International Science Council and which should come into being in summer 2018—will serve as a single, global voice for science and will help to provide the evidence base for, and coordinate action on, issues of public concern. The importance of data for enabling science and for providing the necessary evidence base for action was necessarily both a major concern and discussion point during the meeting at which this historic vote was taken. Access to high-quality data from multiple disciplines is needed to be able to understand and address the complex issues facing our global society. New pluridisciplinary approaches to analyzing and modelling data will be required. And the data upon which decision-making and management of our planet rests must be open access, freely available, and subject to public scrutiny. So far, so good. However, recognition of the importance of free and open access to data is only the beginning. The new 'voice of science' in the 21st century will need to champion the infrastructure required to ensure free and open access to data. Data stewardship cannot be achieved through pious statements or international accords, it requires the existence of data stewards—organizations that are funded and supported to provide professional support for data archiving, data analysis, and data sharing. The mission of the World Data System is, of course, to provide an umbrella for data stewards worldwide and to champion new and better ways of ensuring the continuance of our data infrastructure. But there is still a long way to go to ensure both the continued funding for the many organizations that are part of this landscape and that these organizations continue to adopt and promote best data practices. Too much of the data compilation is currently being done by individual scientists or science teams on short-term funding; too much of the work of data stewardship is currently being done pro bono. Neither of these situations is sustainable. Thus, we must hope that the new International Science Council will make the practical issues of data stewardship in the 21st century a major focus of its work. And then we really will have something to celebrate next summer! The ICSU World Data System (ICSU-WDS) and the Data Seal of Approval have recently collaborated on the alignment of their respective sets of criteria for certification as a Trusted Digital Repository, and is in process of establishing a joint certification authority—the CoreTrustSeal—to manage the certification process associated with it. This activity contributes to a significant future focus on the trust that can be placed in elements of a distributed global research infrastructure, and the increased automation of its verification. However, it is the tip of the iceberg. 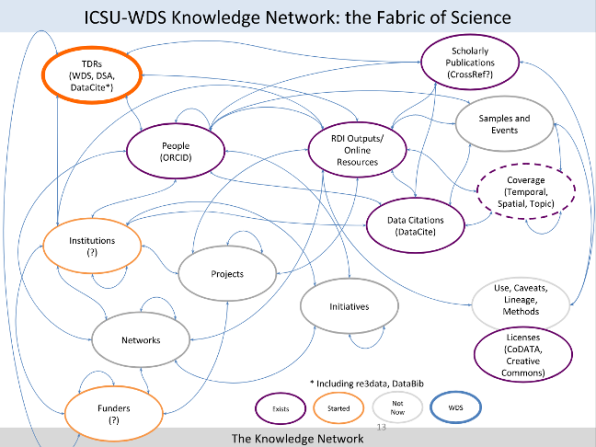 The WDS Knowledge Network defines many of the components of research activity for which there is some form of trusted service or infrastructure component required: ranging from the obvious need to reliably refer to research outputs, researchers, institutions, artefacts, projects, and the like, though the more complex aspects of trusted repositories, registries, vocabulary, and ontology services, to the assigning of levels of maturity, sustainability, or quality to these. The trust that is required for research infrastructure to function properly is somewhat different to the trust that can be placed in the content that is curated by the research infrastructure—although one has to recognize that the two aspects are interrelated and, in some instances, inseparable. Furthermore, the trust that can be placed in content should ideally also distinguish between the significance and usability of that content, and its quality. These facets are not necessarily the same, but again are conflated to some extent in discussions about fitness-for-use, quality metrics, and the like. Let’s work though these distinctions at the hand of some examples. The main aim of a scholarly publication is to assert a claim in respect of a novel finding, and to expose that claim to peer review for the purpose of correction, as required1. One needs to distinguish the rules (criteria for trust) associated with the process of science and the value of the content. The latter is largely judged by significance, and measured—with varying degrees of usefulness—through citation indices and impact factors. There are arguments that this stream of self-correcting progress is broken, especially in some disciplines, and this is strongly related to the criteria for trust. Such criteria are largely stated informally and implemented with varying degrees of diligence in research institutions, and are mostly delegated to peer review to determine if the result is trustworthy. Peer review purports to determine originality (not easily automated, and essentially linked to end-user value), quality (certainly possible to automate) and validity (can be partly automated). One could—and in my view, should—argue that processes can be verified objectively and preferably automatically, and that our aim should be to certify their veracity using measurable criteria. Such validity and quality criteria could be extended to feasibility of reproduction, access to supporting datasets, and the like. References to widely used protocols and methods, standards, samples, and research pattern—increasingly linked to persistent identifiers—also increase the verifiable level of trust in the process. Vocabulary (name) services play an increasingly important role in research infrastructures for a variety of reasons. Firstly, vocabularies and name services are critical to the realization of the semantic web and Linked Open Data: in essence, reducing ambiguity by referring precisely to a concept, entity, relationship, and/or characteristic of either. Secondly, these services are used to enhance the experiences of users and the value of knowledge by navigating the relationships that exist among them, which is conceptually captured in the WDS Knowledge Network and is increasingly implemented, for example, in projects such as Scholix. Again, one should not confuse the acceptability of the vocabulary or service content (e.g., whether all taxonomists in the world agree that a taxon is correct), and the quality of the service provided by the infrastructure component. For the first case, there may never be agreement (especially with taxonomists! ); but, for the latter, it is a relatively simple matter to determine what constitutes a well-defined, standardized vocabulary or name service, and community efforts are underway to document and define these criteria. In addition to such operational requirements, one should include the need for sustainability and continued access into the reasonable future. Significant broadening of services and infrastructure that cover all aspects of the WDS Knowledge Network, as well as a parallel rise in the need for certification of these services and infrastructure. Already, there is a perceived need for the certification of repositories of open source code and of vocabulary services, to name but two. Increased automation of the certification of processes that is in tune with an expected, rapid upturn in artificial intelligence and machine learning. This will be needed because I have no doubt that the scientific method will be increasingly automated within the next decade or so. We are already overwhelmed by volumes of data and numbers of publications, and science cannot scale any further as it is limited by human capacity. 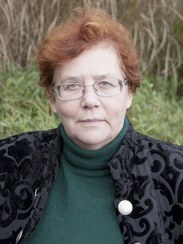 On the basis of the above, and with science increasingly reliant on trust in a wider context, ICSU-WDS should start focussing on defining trust criteria beyond data repositories and services, and on how to automate its assessment: this being the only really scalable solution to a problem of rapidly growing scope. 1 There is a parallel focus on review and consolidation or synthesis based on existing knowledge.